The chart above illustrates the capabilities of the GTOCP4 and GTOCP5 control Box. It features on board Wi-Fi capability, as well as USB and Ethernet ports. There are many options available for controlling your mount whether you are out for a night of observing your favorite objects without a PC (your Keypad serving as your handheld computer), conducting a public star party (imagine using an iPad to "WOW" the kids) or remote imaging (APCC will allow you to control your mount in the comfort of your home). If you own a GTOCP3 Control Box, check out this chart. Your Astro-Physics GTO mount has a remarkable servo control system that combines with the precise mechanics of the physical components to give the mount its superb performance. Contrary to popular assumption, the brains of the mount are found in the GTO Control box, not in the keypad or computer program. Simply think of your Keypad or computer as an input device. This webpage discusses your options for the newest GTOCP4 (for all GTO mounts except the Mach2GTO) and GTOCP5 (for Mach2GTO only) control boxes, as well as earlier versions: GTOCP1, GTOCP2, GTOCP3. All functions of the servo drive can be commanded from a laptop or desktop computer. Astro-Physics has a wholly-owned and fully-supported ASCOM V2 driver for all of our GTO mounts. This is the recommended method for mount control with a personal computer operating under the Windows operating system. Most popular Windows planetarium, imaging, guiding and observatory control software take advantage of ASCOM's universal applicability. Refer to additional information regarding the V2 driver below. The GTOCP4 and GTOCP5 Control Boxes provide multiple options for connecting to your devices. The GTOCP1, GTOCP2 and GTOCP3 control boxes also provide two RS-232 inputs so that you can connect with two separate serial interfaces. This allows Mac users and non-ASCOM programs to have more than a single connection to the mount. For example, you might wish to connect PulseGuide and an ASCOM client at the same time with your Windows computer. On the Mac side, you might wish to connect both Astro-Planner and Equinox for an observing or imaging session. 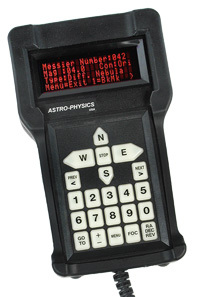 The GTO Keypad (optional purchase with new GTO mounts beginning in mid-October 2016) is a hand-held computer with all of the features, functions and databases you need to tour the universe night after night. The vacuum-fluorescent display with a temperature range down to -40 degrees F (and C, they are the same in this instance), allows hardy observers to use the keypad on cold winter nights (please contact Astro-Physics if you wish to use the mount in severe temperatures below -20F). As new firmware versions are released in the future, you can upgrade your keypad directly from the download section of our website - free of charge! The Keypad is compatible with all versions of the GTO Control Box: GTOCP1, GTOCP2, GTOCP3, GTOCP4 and GTOCP5. Astro-Physics offers a company-supported ASCOM V2 driver. This driver provides ASCOM-compliant mount control for all of the Astro-Physics GTO mounts and acts as a hub allowing multiple client applications to connect through a single serial port without the need for POTH. It has been developed with remote operation in mind and its functions were designed to be highly robust. The driver features a very user-friendly graphical user interface (GUI). Please see this link for more information and to find links to the ASCOM platform and the Astro-Physics V2 ASCOM driver. The ASCOM V2 Driver is compatible with all versions of the GTO Control Box: GTOCP1, GTOCP2, GTOCP3, GTOCP4 and GTOCP5. however, the GTOCP1 and GTOCP2 may not be able to access some of the advanced functions. APCC can only be used with the GTOCP3 (with version V or later of the firmware) and GTOCP4 or GTOCP5 control boxes since it takes advantage of their advanced features. Since PulseGuide was developed years ago, it does not support the later command language. Over the years, we have implemented additional commands and safety features in the GTOCP3 and GTOCP4 control boxes that are not utilized in PulseGuide. With that in mind, we recommend that you consider using your planetarium program with the AP ASCOM V2 driver or for optimum performance consider Astro-Physics Command Center (APCC) - Standard or Pro version. This software, also written by Ray Gralak in conjuction with Astro-Physics, offers more refined custom variable tracking rate control, vastly improved tracking of asteroids and comets in addition to many other advanced features. PulseGuide™ is compatible with all versions of the GTO Control Box: GTOCP1, GTOCP2, GTOCP3 and GTOCP4. 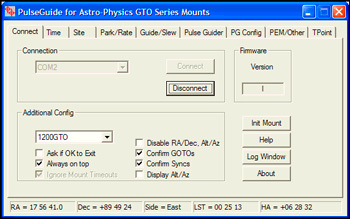 All owners of any Astro-Physics GTO mount can download the software free-of-charge, courtesy of Ray. Please refer to his web site http://www.pulseguide.com. Many, many thanks to Ray for this useful program. Additional note: Much confusion arises from the use of the term "PulseGuide". The term was originally coined by Ray Gralak when he developed his software by the same name. The term is now more commonly used in a different way by ASCOM-Standards to mean any guide move that is sent through an ASCOM driver. 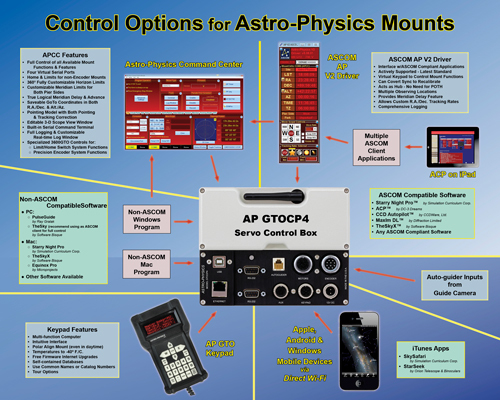 There are a number of planetarium programs that can be used to control the Astro-Physics GTO Servo System. In addition, some software designed primarily for camera control and/or observatory control and planning also have limited ability to control your mount. Many of these use the ASCOM interface and will take advantage of the new ASCOM V2 driver mentioned above. Any software that can use the AP V2 ASCOM driver will have extensive mount control capabilities because of the driver's "virtual keypad" features. Other programs employ native drivers that the software designers wrote from our publicly available command set. The list that follows is certainly not exhausive, but contains software with which we have at least a little familiarity. TheSky and Bisque Observatory Software Suite™ families of products from Software Bisque. These include TheSky 6™ Professional Edition (Windows), The Sky X™ (Windows and Mac versions), TPoint™ (Windows and Mac versions), CCDSoft™ - jointly developed with SBIG (Windows), Orchestrate™ and other components in the Bisque Observatory Software Suite. The Bisque brothers have written their own native Astro-Physics drivers and their Windows programs can also use the ASCOM interface. We recommend that you use the ASCOM interface for more complete and fail-safe control. Earth Centered Universe™ (ECU) v3.1 or later from Nova Astronomics (Windows). Versions including 4.0 and later have full client support for ASCOM telescope drivers including the Astro-Physics V2 ASCOM driver. SkyMap Pro™ by Chris Marriot (Windows). Native drivers for the Astro-Physics GTO system have been included since v.7. Starting with V.10, ASCOM support was added as well. Voyager™ from Carina Software (Windows and Mac). This product does not use the ASCOM interface. SkySafari™ for Mac OS X by Simulation Curriculum Corp - This software is offered through the Mac App Store in three versions. They do not use the ASCOM interface. 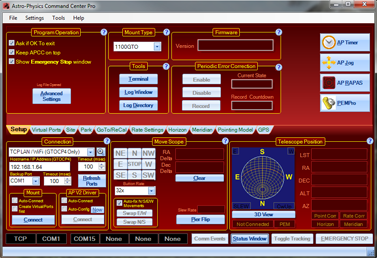 ACP™ Observatory Control Software by DC-3 Dreams - Robert B. Denny (Windows). ACP™ uses the ASCOM interface. Since all observing and automation accomplished through the web browser, you can use your mobile smart device to access the controls for your mount. MaximDL™ from Diffraction Limited (Windows). Imaging software that uses the ASCOM interface. CCDWare Product Suite from CCDWare (Windows). The suite includes CCDNavigator™, PEMPro™, CCDInspector™, CCDAutoPilot™ Professional and CCDStackImaging software. They all use the ASCOM interface. These products can also be purchased individually. Any software that is ASCOM compliant. Be sure that you update to the most current ASCOM V2 driver, which is supported by Astro-Physics. We have entered a new age of smart devices that offer amazing functionality at our fingertips without the need for a computer. If you own the GTOCP4 or GTOCP5 control boxes, on-board Wi-Fi capability is built in. If you have one of the earlier control boxes, refer to the information regarding the SkyFi and SkyWire information below. As of this writing, SkySafari 5 ™ is available in three different versions, two of them offering telescope control. All of these versions are available as iTunes™ Apps and require either the Wi-Fi capability of the GTOCP4 or use of the SkyFi™ Wireless Telescope Controller or SkyWire™ for earlier versions of the control box as described above. Earlier versions of SkySafari also offer telescope control. The GoTo mount control functions provided by this application are quite basic and most suited to visual astronomy. However, the graphical interface of your iPad™, iPod Touch™ or iPhone™ offers some exciting possibilities to engage kids (young and old) at public star parties, as well as provide an enjoyable, informative evening for amateur astronomers on observing nights. Also, if the weather is cloudy, you can browse through the extensive databases to learn a great deal about the sky and plan your next session. 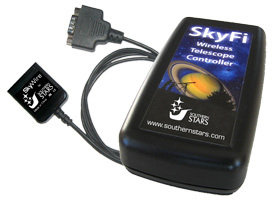 SkyFi™ is Southern Stars' patent-pending WiFi-to-Serial adapter that is designed for wireless telescope control. If you have a computer-controlled GoTo telescope, SkyFi™ can use the WiFi capabilities of your Mac, PC, iPhone™, iPad™, or iPod Touch™ to point your telescope (via your mount) in the sky. SkyWire™ can connect the iPhone™, iPad™, or iPod Touch™ directly to your mount via wired connection. It has an Apple device plug on one end and an RS232 plug on the other. In 2010, Simulation Curriculum's SkyFi™ and SkySafari™ (discussed below) were Macworld Expo 2010 Best of Show winners (both products were marketed by Carina Software at the time of the award). Check this link to see Tim Benedictus demonstrate these products at the Macworld Expo. The Astro-Physics GTO protocol for the GTOCP3 Control Box through version Q is freely available to those who would like to write their own computer program for controlling the mount. Note that this does not include the command language for either the Precison Encoders or the Absolute Encoders. Please note that with our substantial investment in both the Astro-Physics V2 ASCOM driver and in APCC, we cannot also provide free technical support to anyone who wants to try their hand at mount control software. We strongly encourage all customers to use the available software options, if possible. 11250 Forest Hills Road, Machesney Park, IL 61115, U.S.A.